The Yukon River in North America runs from northern British Columbia into the Yukon Territories and through Alaska. Salmon and other fish travel up Yukon River to spawn, and thus making the river and important food source for a diverse number of species including humans and dogs. The salmon runs are heavily managed and controlled by the Federal Governments of Canada and particularly the United States of America. Fisheries and hatcheries have been established to counteract on declining 'wild' salmon populations. Similar to Fennoscandia there is a debate between the relationship of 'wild' and 'farmed or tame' salmon. At the same time there is a discussion between up and down Yukon River about management policies and harvesting fish. Our research elaborates on the relationships between fisheries, 'wild' populations, fish science, management policies, and the interplay between fish, dogs, and indigenous peoples. 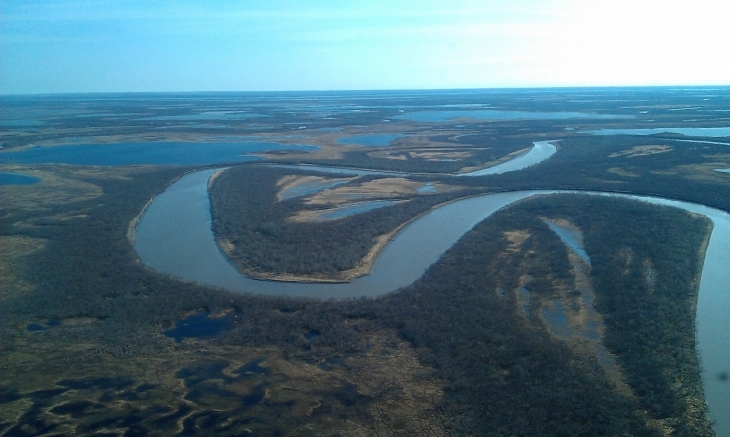 Arctic Domus associated scholar Dr. Gro Ween conducted fieldwork in the mouth of the Yukon River, in the village of St Marys - a community of 600 people not far from where the Andreafski leaves the Yukon. This land is the home of the Central Alaskan Yupik people, the most numerous of Alaskan native peoples. Yupik people in this area have always moved between camps, fishing in the summer, hunting and trapping in the winter and continue to do so. In this part of the Yukon River, the landscape is a mixture of rivers, creeks, wetlands, with boreal forests and some mountains. Pacific salmon, and most importantly, King salmon have always been of vital importance to their diet. Animals were hunted and trapped both by women and men, both for food and clothing and previous time periods also for sale. Ween spent a period of fieldwork in St Mary’s in June and July 2013 following the King salmon and the summer chum runs. In St Mary, she took part in fishing expeditions, and learned from the Saint Mary’s women about how to make fish into food. In her research, Ween has been interested in how people fish, their knowledge of the fish, and of salmon management. 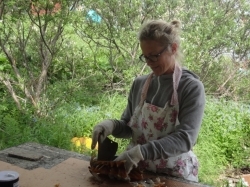 Ween has explored the importance of salmon for Yupik people, how the salmon figures in relationships with other animals, and how the salmon through history both has united and separated people. She also has a deep interest in women’s activities, the making of animals into food and clothing, and the inter-species relations that this involves.